Located at the foot of the Rocky Mountains, the city of Boulder is a leading force in research, technology, and entrepreneurship—a place where innovation happens. In the heart of the city, CU Boulder produces some of the best and brightest in these industries and is a primary source of Colorado’s highly skilled workforce. Our talented faculty, students, and alumni are leading the way for the next generation by inspiring scientific, humanitarian, and social enterprises. Our emphasis on a customized education combined with our dynamic academic programs, hands-on learning opportunities, and rigorous course work are at the cornerstone of the CU Boulder student experience. 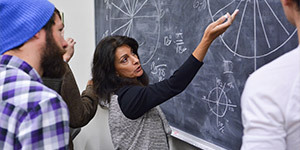 Within our supportive learning community, you’ll interact with our exceptional faculty—which include Nobel Laureates, MacArthur “Genius Grant” Fellows, US Professor of the Year awardees, and National Medal of Science winners—who will be listening, questioning, and helping you refine your ideas so you can develop a broad understanding of the world, strong leadership skills, and an enhanced ability to think critically. 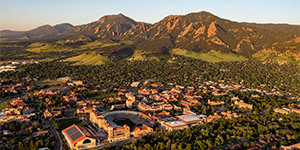 CU Boulder has eight colleges, schools, and programs: College of Arts and Sciences; College of Engineering and Applied Science; College of Media, Communication, and Information; College of Music; Leeds School of Business; School of Education; School of Law; and the Program in Environmental Design. Among them we offer more than 3,900 academic courses across 150 fields of study, enabling you to create an academic experience that is totally unique to you. At CU Boulder, the hard work happening in our classrooms, labs, recital halls, and studios is passionately balanced with enjoying the beauty that surrounds us. 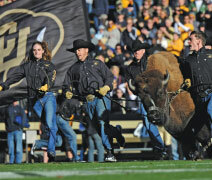 We have one of the most active college campuses in the nation, where recreation, sports, and student groups play key roles in the unique CU Boulder experience. Within our inclusive community, you’ll find many ways to get involved and make lifelong friends. And you’ll have the opportunity to serve the greater good through volunteerism and civic engagement, whether it’s around the world or across the street. CU Boulder students are encouraged to customize their education to their unique interests by taking classes across academic disciplines so they’ll be ready to contribute to today’s rapidly changing world. With their hands-on experience, world-class education, and the ability to think critically, globally, and creatively, they benefit from a strong salary potential, high employment rates, and the opportunity to find and excel in a career they are truly passionate about. • 91% of CU Boulder graduates were employed, in graduate school, or in military service within six months of graduation.